Hello, very interested in your adapter-if I buy your adapter with oil and water sensors, what else will I need to do the conversion besides the gauge cluster itself? Where could I purchase these items, and what is a rough estimate on cost so I know what I'm looking at price wise. Thank you for your time! You will also need a digital fuel sender from an ae86 or a Cressida. I have parts to make 4 setups and also have 2 Cressy digital fuel senders. have a set up for sale for $300 consists of. Still got it, emails have been replied to. I have an adapter with sensors available right now if anyone is interested. Can you still make the harness? Got a set ready to go..
Hey Rongfk, what would it take to get this to work on my true JDM Levin? I have a digital cluster, the digital oil pressure, digital fuel sender. What I need is the wiring harness and would like to know if you would be able to build me one of these. I really do not want to cut and splice into my wiring would like to have a plug in ready to go. Let me know what you can do and the price if you are going to do it. do you know if this adapter will work for jdm analog cluster? i have jdm analog cluster that i want to plug into my usdm ae86. i see there's tutorials on how to swap the pin outs so this works but i'd rather have an adapter so it's easily reversed. plus, i'm super color blind so this would be pretty difficult for me to do myself. lol. sorry this will not work for it, jdm digital only. i also have a jdm kouki cluster that i have been trying not to cut up for these. Do you still have these bundles for sale? rongfk wrote: sorry this will not work for it, jdm digital only. i also have a jdm kouki cluster that i have been trying not to cut up for these. ok. i'd def be interested if you ever make an adapter for analog jdm cluster. bump for you. You mention you now have one for jdm to jdm? How much for just the harness and water temp and fuel sensor? Postage will be to an address in Oregon. yes, i can do them for JDM analog to Jdm digital, they require more work, but the price is the same 350 also it is for the adapter harness, oil and water sensors. i don't have any fuel senders, but i posted a link to something that may work for that in my original post. Sent you a PM and an email. Thanks man! rongfk wrote: yes, i can do them for JDM analog to Jdm digital, they require more work, but the price is the same 350 also it is for the adapter harness, oil and water sensors. i don't have any fuel senders, but i posted a link to something that may work for that in my original post. Hey mate. What's the lead time on the harness? Can you email me matt@garagedori.com and we will organise a deal. awesome, anyone else need these? ill check to see if i have the parts to make one and get back to you. 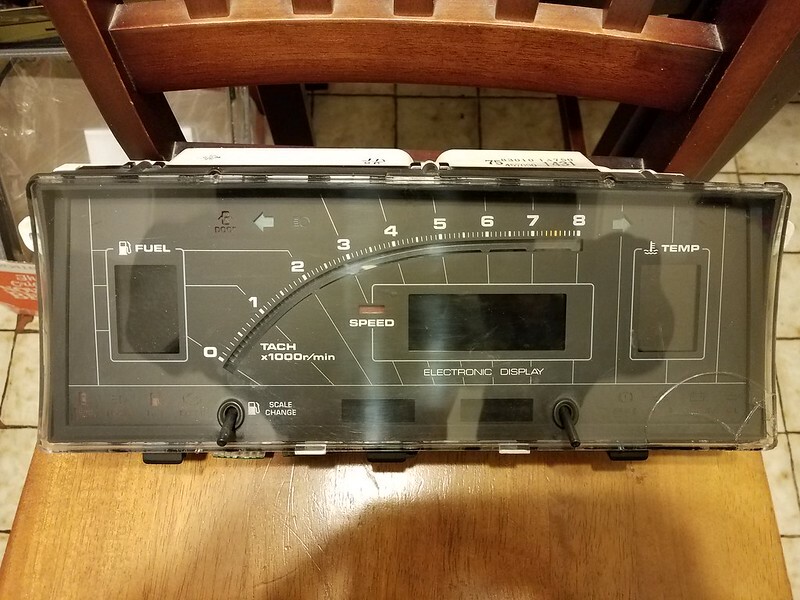 I have this JDM Ae86 digital cluster for sale. It has been converted for a plug and play set up (a $350 cost), but the cluster doesn't turn on, don't know whats up with it, got it from ebay (japan). If you know a good electrician or someone who knows their way around resistors, diodes, etc. could probably get it going. or if you have one already you can switch out the internals and have a good pnp cluster. 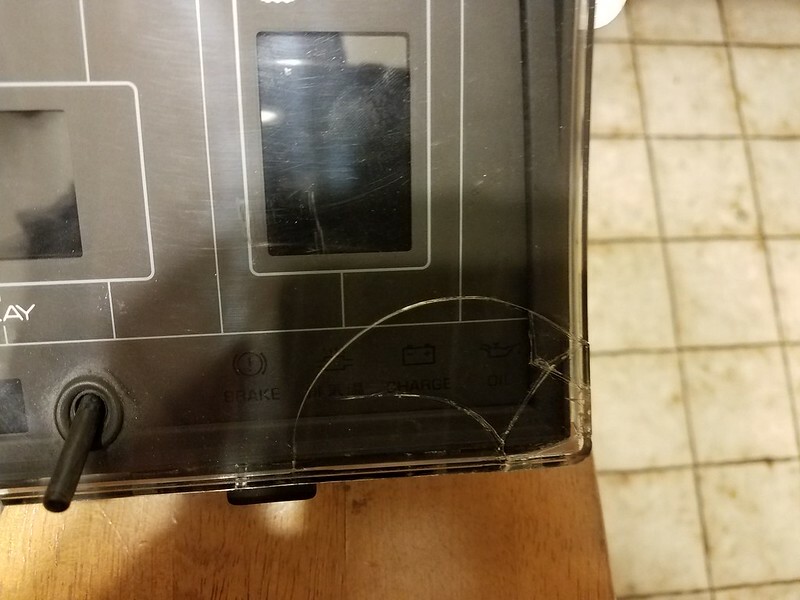 It has a damaged clear cover as seen in the pictures. asking $400 plus shipping and fees. I currently have an adapter set available if anyone is interested?